If you own (and use) a Nintendo 3DS, you've probably noticed that the system's top screen can get marked up and scratched rather easily, just by closing and carrying it around for the sake of Street Passing. Nintendo has recommended that 3DS owners place a cloth between the screens to prevent any damage, but some gamers just weren't satisfied by that hit-or-miss solution and opted instead to think outside the box. One NeoGAF MacGyver yanked the rubber feet off an Xbox 360 and adhered them to the top corners of the 3DS. 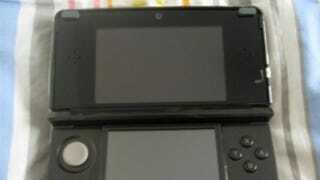 That keeps the top and bottom screens of the 3DS from touching when the system is closed, and therefore alleviates the scratches and marks on the top screen. The folks at MS Xbox World even checked with Nintendo, and discovered that this simple action, which is reversible considering the feet can be removed, keeps your 3DS warranty intact.